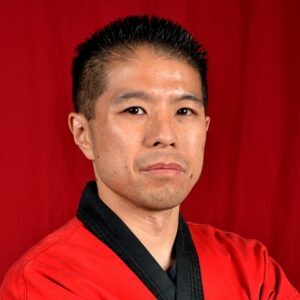 Sensei Jason Peng is the Southern California Director for Karate, Art, Basketball, and Soccer for 8 years! He has been involved in Martial Arts for over 26 years and has a 1st degree Black Belt. Has experience in Goju Ryu Karate, Tae Kwon Do, Boxing, Muay Thai and Brazilian Jiu-jitsu. Has been teaching at South Gate for 11 years and Fountain Valley for 8 years. Something’s a little more personal about me is I love to watch horror, comedy and action films, playing video games, NBA, wrestling (WWE), and eating different types of food. I collect old transformer toys from the 80’s. I also won the 4th grade spelling bee champion. Last but not least on my free time I also like visiting Taiwan and Las Vegas.